Philosophers and scientists have wondered for millennia about what makes us who we are, whether it is nature or nurture. It's a debate that predates even Darwin and modern biology. Can the Cockney flower girl Eliza Doolittle become a real lady? Can Moe, Larry and Curly become true gentlemen? Or, like Popeye the Sailor, are we what we are and that's all that we are? To put a finer point on it: Are monsters born or bred? 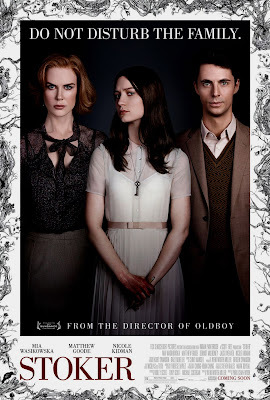 That's the head-high thicket into which director Chan-wook Park wanders in "Stoker" (DVD and Blu-ray), one of the year's most daring and disturbing films. All is not right with India Stoker (Mia Wasikowska). As she says, her father is dead. But that is just the beginning of what troubles her. Her mother, Evelyn (Nicole Kidman), is self-absorbed and perhaps overly eager to move on following her husband's death. India is the exact opposite, and we wonder about the nature of her relationship with the father who took her on weekend hunting trips and helped her amass a collection of taxidermied kills. "He used to say, sometimes you need to do something bad to stop you from doing something worse," India tells us, leaving those of us familiar with "Dexter" in mind of Harry's Code. While Evelyn longs to get out of the house for shopping trips and ice cream excursions, India is in mourning, draped in Puritan black and reading books about death rituals. You could cut the tension, or perhaps a throat, with a knife. Then arrives Charles Stoker, or as Evelyn calls him, "Uncle Charlie," her dead husband's brother and the uncle India never knew she had. Isn't is odd to have an uncle, your dad's brother, whom no one ever bothered to mention? India thinks so, but her face, as always, betrays nothing. Still, Charles (Matthew Goode of "Watchmen") is eager to help. He cooks. He tends the garden. He spends quality time with Evelyn, who seems only too eager to play Queen Gertrude to Charles' usurping Claudius. But India is no Hamlet, and what Charles most wants is to take his blossoming niece under his wing. He wants to be friends, but as India observes, they don't have to be friends when they're family. And family ties are the ties that bind, sometimes with zip ties. Before long, India and Uncle Charlie are seated together at the piano, and for the first time, India, her fingers dancing on the keys, displays passion. Where India's tutelage with her father left off, her tutelage with Charles picks up, and the gleam in Uncle Charlie's eye looks like something more than pride. Coming of age isn't easy for anyone, especially in the movies, but coming of age in the Stoker family presents unique challenges that flirt with breaking the most taboo of taboos. Park, a South Korean director best known to American audiences for his "Vengeance Trilogy" — "Sympathy for Mr. Vengeance," "Oldboy" and "Lady Vengeance" — delves deep into the aesthetic of "American Gothic" for this tale of a family in decay. The promotional art gives the game away, depicting Kidman and Goode as Grant Wood's unhappy couple, with Wasikowska as the pitchfork in the middle. Wasikowska (Alice in Tim Burton's "Alice in Wonderland") gives what can best be called an obsessive performance, which combines an eerie lack of empathy with a sense of something burning beneath the surface. It's a performance that captivates and repels, and most of all surprises. Nothing, least of all India, is what it seems.